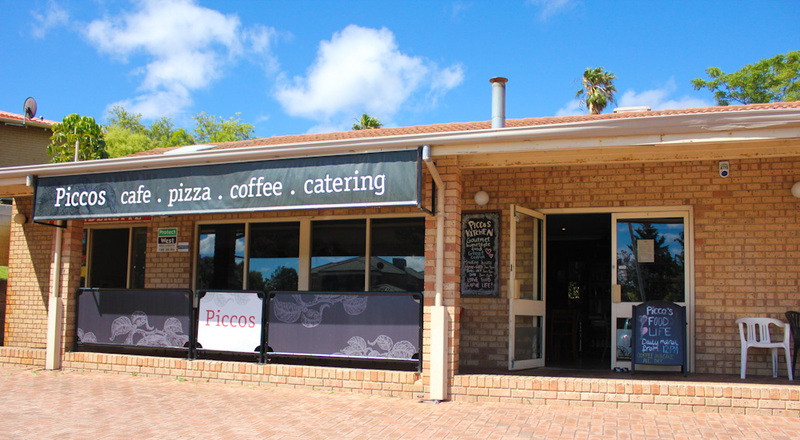 If every neighbourhood had a hidden gem, Picco's Kitchen is probably one of the shiniest, polished, most exquisite gem in the suburb of Maylands. 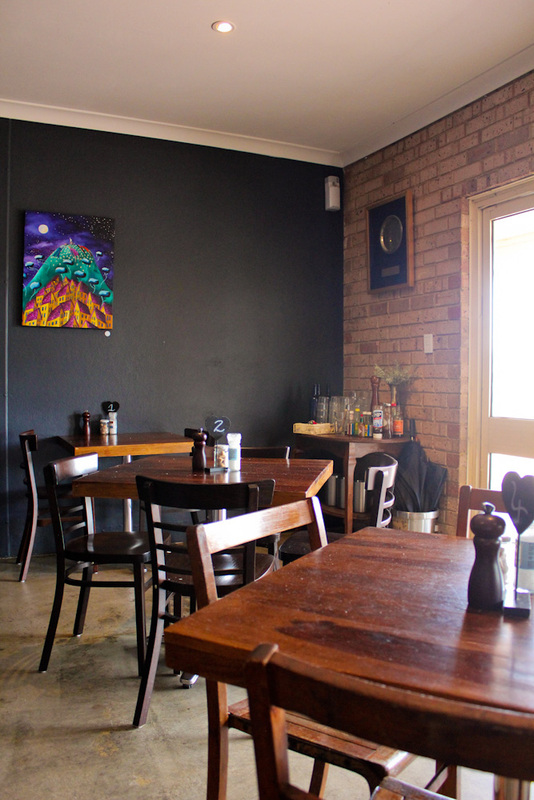 Deep within the regular residential streets in Maylands, far far away from where a restaurant would be expected to be in this growing foodie hub, is indeed a quaint little restaurant looking like a residential home itself. "Unsuspecting" would be the word for the place - location, furnishings, right down to the changing daily menu that is posted on their Facebook page that promises gourmet homestyle food. No printed menus available and ordering your meals off a handwritten menu on a sheet of paper strung up behind the counter really proves, that "daily menu" actually means DAILY menu. I guess the only down side to such a temperamental menu is that we all have to imagine the yumminess of each dish and judge based on looks, because you will probably never see my dish again when you visit, and nor would I see yours. I really like the ambiance of the place, with all its wood themed furnishings amongst the dark, earthy colours that make up the walls, counters and cabinets. 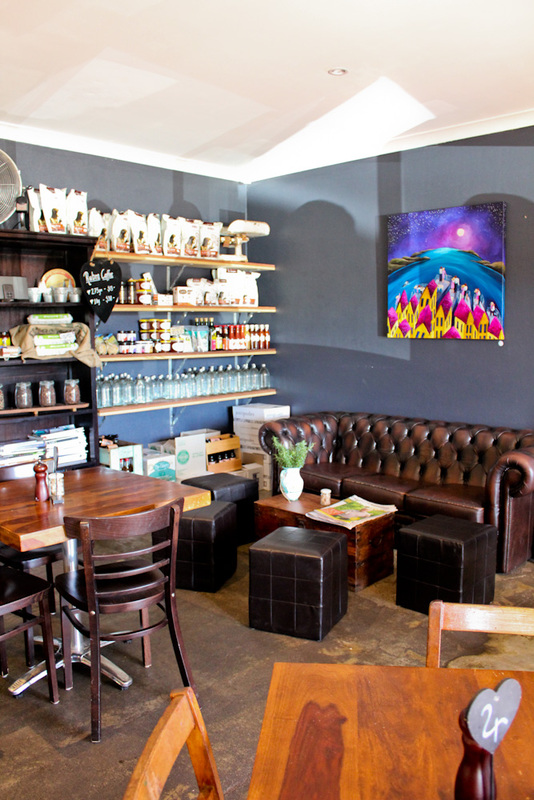 It is a cafe styled typical of others but with loads of natural sunlight streaming through to brighten up the dark colours into lighter blues, browns and greys. 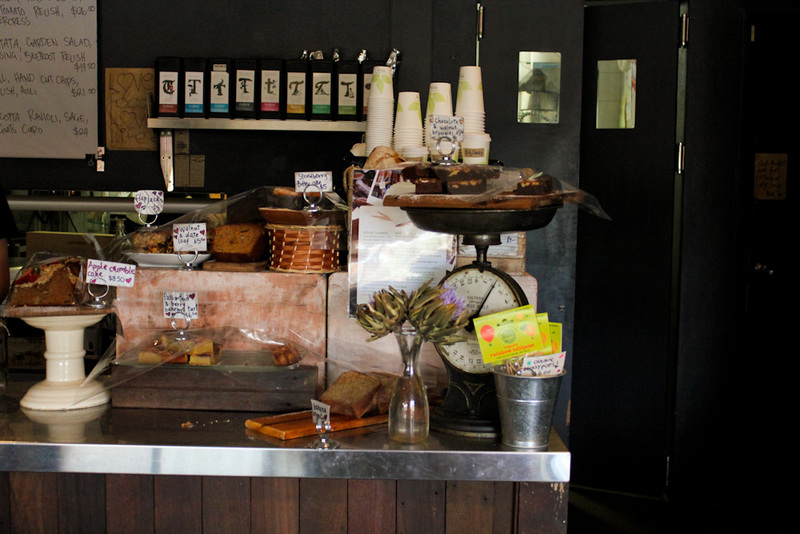 Right next to the counter where you order your mains is a nice little setup of your usual evil cafe temptations, ready to sidetrack your brain into ordering more than you (or your thighs) really need or originally intended. 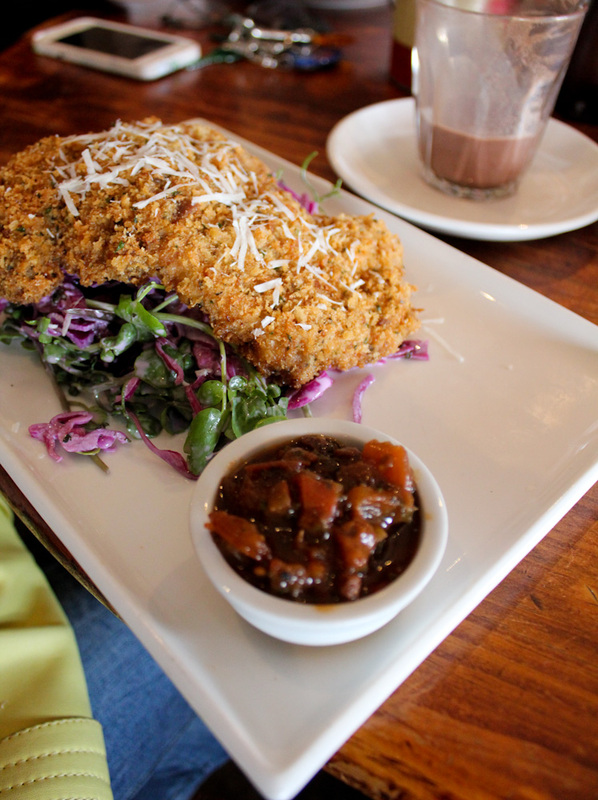 A ordered the crispy coated chicken cutlet, which came with a red cabbage and fennel slaw, watercress, pecorino cheese and tomato relish on the side. It looked deliciously golden crumbed and comfortably massive. In fact, many of the day's dishes we ordered were generously sized and looked attractive, even presenting a threat of food wastage to smaller eaters on the table. M, the smallest eater of mankind, ordered the sausage roll. But this wasn't just a sausage roll. This is the mother of all sausage rolls, that she only managed to get through 1/4 of. 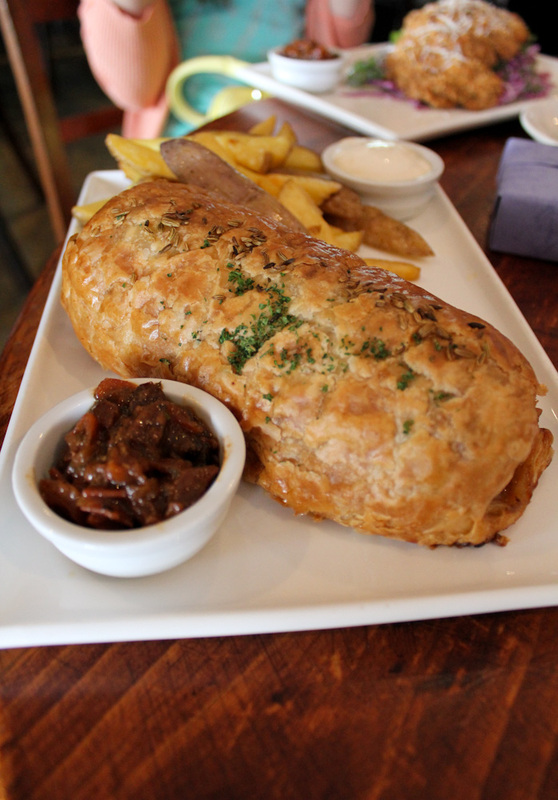 At $21.50 for a sausage roll, this was accordingly supersized and blown out of its normal proportion by around 300%. I am not sure if you understand the size of this, and it took us all a good while to get over it. I tried a bit of it; all the layers of flaky buttery pastry just about melts on your tongue and made even creamier with the aioli. 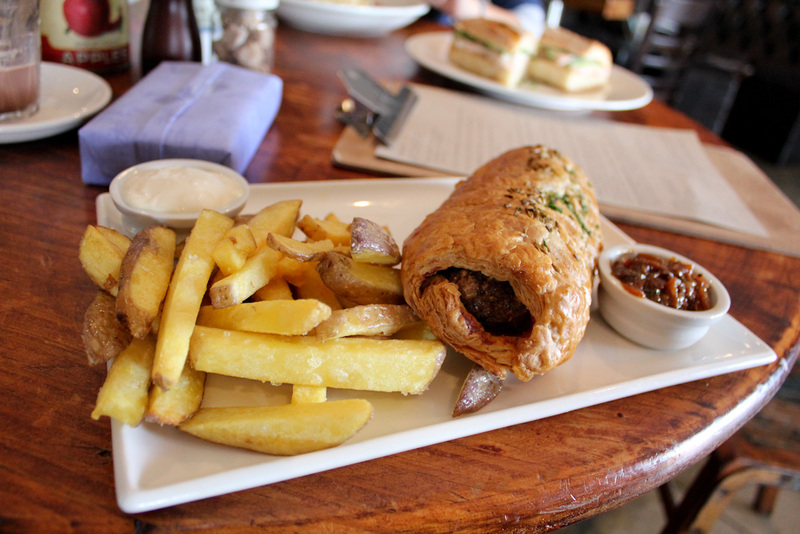 It's no wonder the hand-cut chips went unfinished on the plate, along with a 3/4 sausage roll. 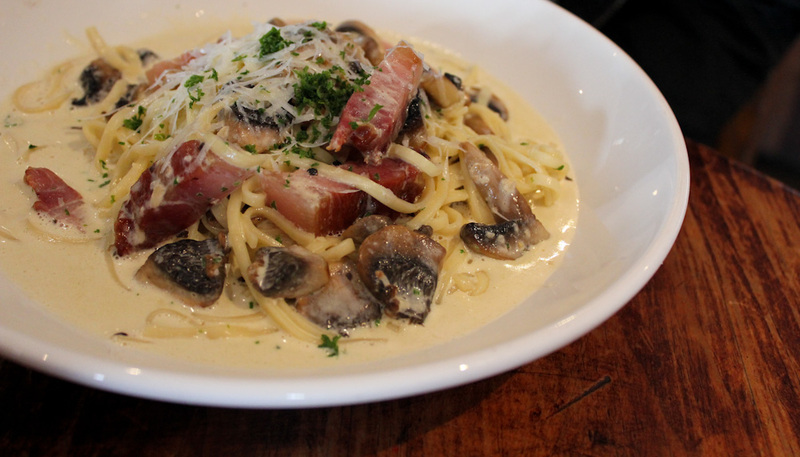 This scrumptious pasta dish was laden with a garlic cream sauce, heaped on with smokey pancetta pieces (albeit a bit tough), mushrooms and garnished with slivers of pecorino. Sources say that although yummy at first few mouthfuls, the dish does get a little heavy. And me, I went down the road of simplicity today, and chose something out of their cabinet instead. 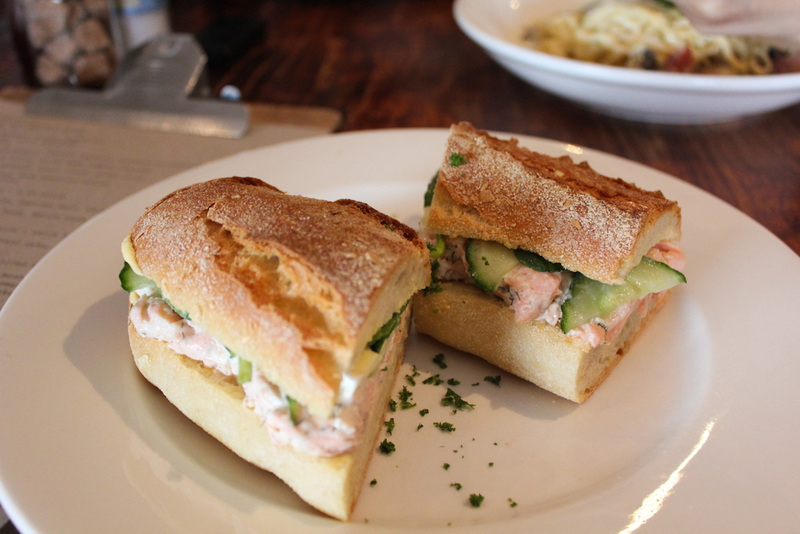 The admittedly smallish buttered baguette was filled with chunky salmon pieces, mixed with dill and sauce, to which I asked if my bread could be toasted. They did this for me happily, with a warning that the bread will turn hard with toasting. I thought this was really nice of them to do, along with the very pleasant service we received the whole time we were there that's best described as cheerful. This is an extremely rare sight, as I do believe Picco's Kitchen has quite the cult following of the community for its food and coffee. If you want your dining surroundings to look like this, I suggest you get out of bed a little later and have your brunch here past noon in utter serenity. One section of the cafe is set up with a shelf of assorted items for sale, from honey to sauces to Rubra coffee beans. There's also the general mish mash of furniture like the old chesterfield lazing in the corner, that's exactly like the ones I have at home. Which I gotta admit, is uncomfortable as hell, unless you like the idea of coming home at the end of the day and relaxing onto a plank of wood. 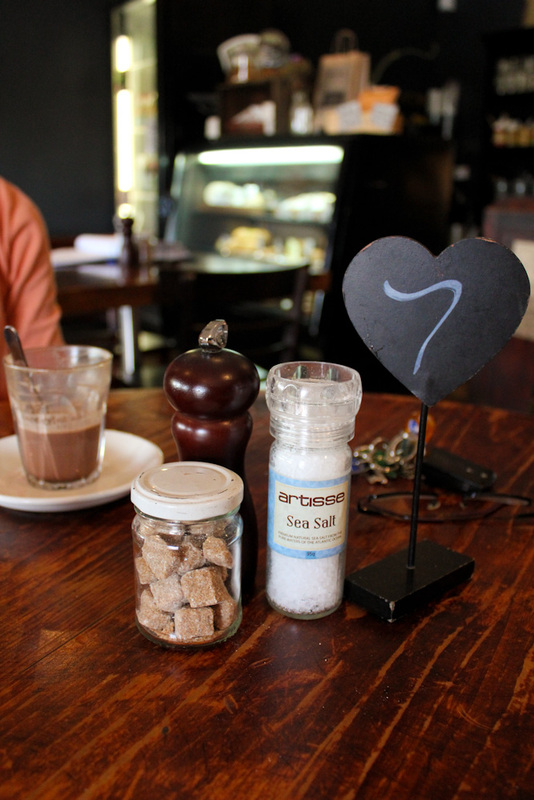 There's a very agreeable slogan that you see scrawled on boards, paper and walls throughout the cafe that reads Love food, Love life. I love Piccos. So understated but so awesome!